The Spektrum DX5 Rugged 5-Channel DSMR Surface Radio redefines transmitter control with a level of durability to match the tough conditions off-roaders, bashers and boaters encounter constantly. Starting with a chassis based on the superb Spektrum ergonomic design found on the popular DX5C and competition favorite DX5 Pro. By integrating cordless power tool protection features, the DX5 can endure similar punishment. 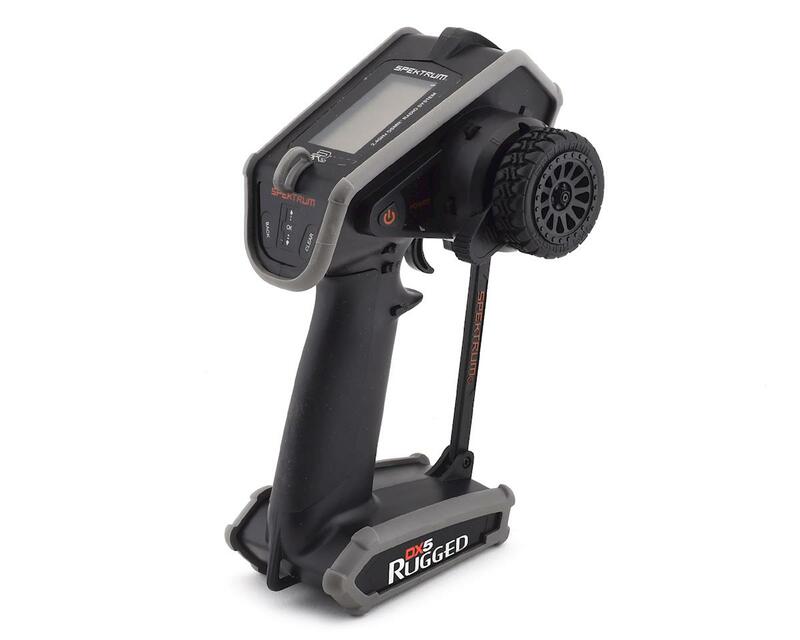 The result is a class-leading RC system with unmatched durability in addition to other innovative features that unite with a level of precision, versatility and convenience you won’t want to play without. Molded Thermoplastic Polyurethane (TPU) bumpers surround the radio chassis to protect it against drops, bumps and even a few bangs here and there. There’s no external antenna to snag or worry about—a low-profile ridge on the chassis protects the robust high-speed signal output internally. A versatile front chassis guard enhances durability further and provides mounting options for user-integrated accessories such as a camera, light source or anything else. The pair of lanyard mounting points gives drivers the ability to keep the transmitter close and gain a free hand when not driving. An easy-access accessory compartment makes it possible to can carry small tools, such as a T-wrench that smartly snaps into the internal mount provided. Transmitter water-resistance has been increased to give drivers peace of mind should there be an unexpected splash of water or some drops of rain. Last, but not least, is an aggressive off-road style steering wheel that expands its ruggedness even further, AND equipped it with an innovative thumb-lever to make controlling your vehicle with one-hand safer and more precise. To conquer the wild, the DX5 Rugged gives you 5-channel versatility and hosts an array of auxiliary switches for lights, winches and more. Its interface features an innovative capacitive-touch control panel that offers a greater resistance to moisture and is easy to use. Simply slide your finger over the control panel and tap to select the menus, options and values on the easy-to-read LCD display. Integrated telemetry capability allows you to view vital data such as motor RPM, vehicle speed, battery voltage and temperature right on the transmitter in real-time (Vehicle must be equipped with a telemetry-enabled receiver like the SR6000T - sold separately). No matter what you're driving, the AVC® technology programming capability in the DX5 Rugged can be easily tuned meet your skill level or driving style with control that makes it feel like you're at the wheel of a vehicle that handles predictably at every speed. Unmatched Durability: Starting with a chassis based on a superb Spektrum ergonomic design, we were inspired by the punishment capability of cordless power tools, and translated their die-hard engineering to the specific needs of the RC driver. The result is a shock-absorbing rubberized bumper design that surrounds the transmitter chassis to form a level of protection never offered before on a surface transmitter. Aggressive Styling: The DX5 Rugged stands out as a transmitter platform that means business handling the wildest terrain, the toughest conditions and fierce competition without any worry. That’s why we designed durability hand-n-hand with convenience. A built-in side compartment offers tool storage, and two lanyard mounts (one rubber, one molded into the chassis) are supplied so you can be hands-free in an instant. Inspired Ergonomics: The ergonomically-recognized DX5 Pro and DX5C transmitters paved the way in giving the DX5 Rugged™ a feel any driver could appreciate. Overall low weight offers all-day driving with minimal fatigue, while the non-slip rubber grip and its trigger-throttle action offer a precision experience that feels natural. Versatile Chassis Guard: We built-in a front chassis guard to increase durability further and make it possible for users to creatively self-integrate personal accessories and/or features such as a camera or light source—the sturdy guard itself and its mounting points are at your disposal. Breakthrough Steering Control: The aggressive off-road steering wheel tread helps the precision of Spektrum technology to also deliver a tactile feel even if you’re crawling, bashing or boating in harsh conditions. The integrated thumb-lever innovatively makes it possible to steer one-handed safely and with a higher-level of precision. Capacitive Interface: Toward the matter of improving water-resistance the scroll wheel and buttons were exchanged for a capacitive-touch sensing control panel that responds to the simple touch of your finger. Sensitivity of the panel can be adjusted and a large LCD display helps make navigating the intuitive software easy. Easy to Program: Programming the DX5 Rugged is simple. An intuitive interface makes navigating menus and changing settings easy. Most users can complete complex programming tasks on the fly. 5-Channel Receiver Included: Built around frequency-agile DSMR® technology the Spektrum™ SR515 5-channel receiver included delivers superb range and response, especially in places where a lot of 2.4GHz systems are in use at one time. Unbeatable signal security in a small modern package makes this sport receiver a top-pick for bashers, boaters, racers and rock crawlers. Plus, we integrated a versatile bind-button so that no bind plug ever needs to be on-hand. Frequency-Agile DSMR® Technology: The DX5 Rugged is built around frequency-agile, DSMR 2.4GHz technology. This exclusive Spektrum™ technology can be used in any type of surface application, including boats. Its range and response, particularly in noisy 2.4GHz environments, are superb. It's also backwards compatible with DSM2® and marine-specific Spektrum receivers. This means most longtime Spektrum users can continue to use the receivers they have. They’ll only need to upgrade if they want the frequency-agility of a DSMR receiver for busy 2.4GHz environments. AVC® (Active Vehicle Control™) Programming: The DX5 Rugged makes it possible to custom tune an AVC system by providing easy-access to dedicated adjustments. In addition, open channels of the Rugged can be used to adjust the AVC steering and throttle systems independently. No matter what you’re driving, AVC technology can easily meet your skill level or driving style with control that makes it feel like you’re driving a finely tuned vehicle that handles predictably at every speed. Nothing! Everything you need to enjoy your DX5 Rugged is included. It's a very good product. It is a very valuable product optimized for mountain climbing.